Write party information in a secret code on the invitation that guests will have to decode. (Scavenger hunts, treasure hunts, spy or detective parties. )Bottles of bubbles - print out a large label with the party information and details. Stick the label to a bottle of bubbles. 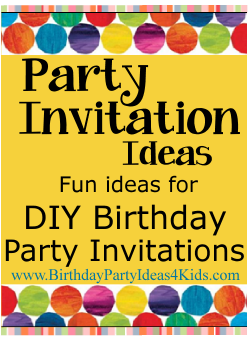 Send something from your party to get guests excited about attending the birthday party! Princess, Dress Up, Cinderella or tea parties. Make this fun invitation resemble a treasure map. After printing information on a sheet of paper dip them in tea for a few minutes to stain them brown and make them look old. Dry and then roll up and fasten with a cord or string. Write the party information on a beach ball, deflate and then mail the beach ball to the party guest. Ask them to bring the beach ball to the party and play these fun beach ball games! Send an invitation in the form of a pillow or sleeping bag. Make a cute insert that fits into the sleeping bag with all the party information on it. Decorate plain invitation cards with stickers that match the theme of your birthday party. 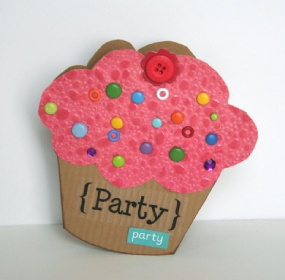 Print out party information 4 to a sheet of paper, cut and glue inside the invitations. If stickers that match the party theme can't be found use dots, stripes or shapes in the color of your party theme. How to get guests to respond to your party invitation. - How to handle who pays for what at away venues such as amusement parks. - How to ask guests to no bring a gift for the birthday child, but give to a charity. And many more scenarios that could happen at a party.